Yesterday we woke to a mist hanging low among the trees and houses, and when it lifted autumn had come. Our breath rose in puffs around us as I walked the kids to school, and later in the sunshine the highest branches glowed amber and gold as if newly gilded from above. 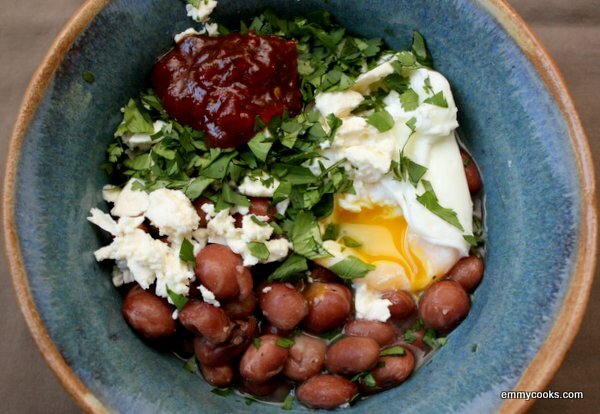 You need some warmth in your belly on days like these, and this bean bowl is a fortifying way to start the day. It’s inspired by the menu at the Beachcomber Cafe in Trinidad, CA—a wintry place most days of the year, so they know warm-you-up food. For a real indulgence, start with a homemade pot of beans. I know I’ve already sung the praises of the ojo de cabra beans pictured below (from Rancho Gordo), but white beans or black beans make a fine substitute. With black beans, of course, you can go the cilantro and salsa route; with white beans I love parsley and tomato jam. 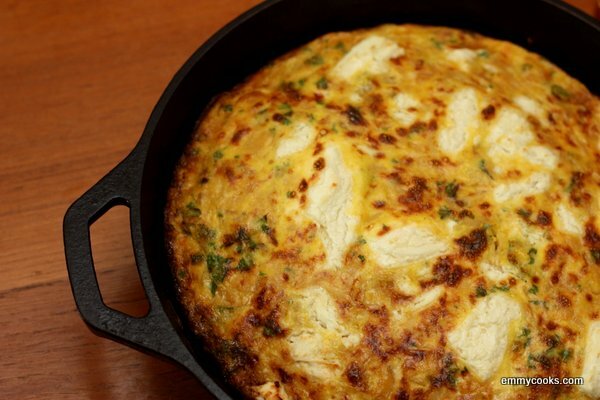 The only essential ingredients are beans, a soft-cooked egg, and a cold day. This entry was posted in Uncategorized on October 10, 2013 by emmycooks. Let us outshine the random acts of violence in our world with random acts of kindness. I’m holding my girls even closer than usual this week, and trying to do my part. One nice, small thing you can do for someone is to peel them a pomegranate. My parents have a pomegranate tree, and my dad has mastered this act of generosity after years of lovingly extracting the sweet seeds for my mom, and us, their children, and now my children. (When he left after a recent visit, my baby had learned to say “I wan’ mo’ pom-a-gran-ate.”) I’ve long relied on his expertise to avoid the task myself, but this week I had good luck scoring the fruit’s leathery exterior—without cutting into the juicy arils—and prying off the outer peel one section at a time. Releasing the seeds is slow, meditative, an act of love. J and I crunched the seeds by the handful, and my big girls happily ate them one at a time, sucking away the fruit and spitting out the tiny seed. What a luxury it is to be together, to eat a pomegranate together. I’ll be posting here less often in the coming weeks, and spending more of my time delighting in my family’s company while the girls are out of school. May there be much happiness in your holiday season, and so much kindness in the world. This entry was posted in Uncategorized and tagged acts of kindness, peace on earth, pomegranates on December 17, 2012 by emmycooks. Help! Thanksgiving is Tomorrow and I Have No Plan! You already know that I’m not much of a planner. But here’s how not-much-of-a-planner I am: it’s Wednesday now (or it will be in a few minutes), Thanksgiving is tomorrow, and I have no plan. No plan! That might sound ridiculous, since I’ve been giving you Thanksgiving meal planning suggestions for weeks. But behind the scenes, I haven’t actually been planning to cook on Thanksgiving myself. We’ll be on Vancouver Island, in Victoria, BC (where Canadian Thanksgiving was observed weeks ago, I know, but no matter). We’ll be in a rental with a (probably inadequate) kitchen. We’re meeting my brother and his sweet little family, so it will be a small gathering. We’ve been playing it cool; we vaguely talked about skipping Thanksgiving dinner in favor of a fancy high tea, or picking up tacos from Hernandez. But it’s Thanksgiving, and I like cooking for Thanksgiving. And have you ever tried taking two toddlers and two barely-older children to high tea? This entry was posted in Uncategorized on November 20, 2012 by emmycooks. In which I fall in love with savory oatmeal, salvage a pot of giant beans, and still have apples coming out of my ears. Also, we went to California (where my sweet mama fed us this and this), then took an 8 p.m. flight home with three children. We are fearless. We are foolish. Note to self: children never sleep on planes when you want them to. At least we had good snacks. Menu 1: I cooked up a pot of white beans using a bag of Greek gigantes (yes, they are giant) I found in the back of my cupboard. And I cooked and cooked and cooked that pot. Hopefully your beans haven’t been sitting around as long as mine, which took hours to become tender. But they were good in the end! We had a simple dinner of white beans with roasted delicata squash and an oregano-olive oil drizzle. Menu 2: I pureed the leftover beans into a spread using some of the bean cooking liquid and some of the oregano oil. We served it on baguette rounds alongside a big pot of vegetable-and-bean soup and a green salad with pears and hazelnuts. This was an easy way to feed ten on a weeknight. 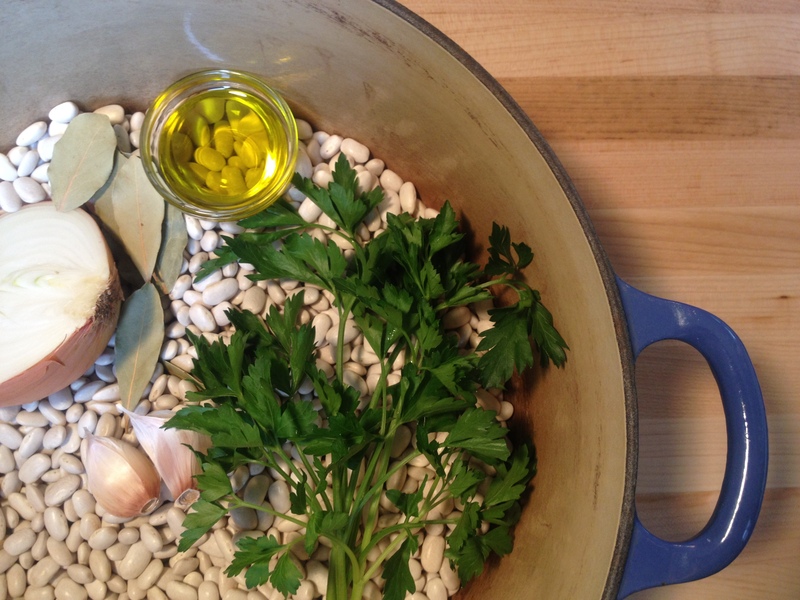 Watch for recipes for the white bean puree and the soup this week! I still have a fridge-full of apples that escaped the applesauce binge. 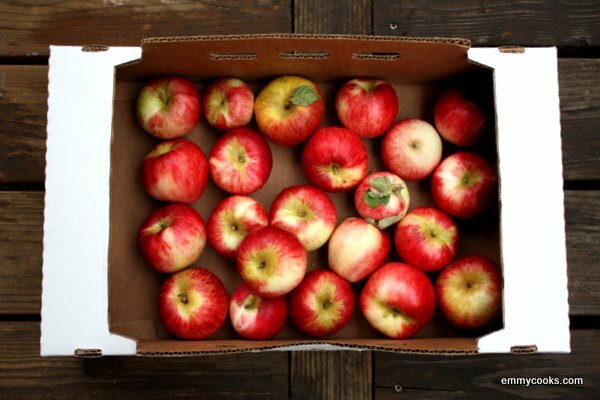 Our fruit CSA is giving us a huge weekly box of apples. I have this apple-lemon-honey jam in my sights. Any other apple novelties I should know about? What about recommendations for healthyish apple baked goods? 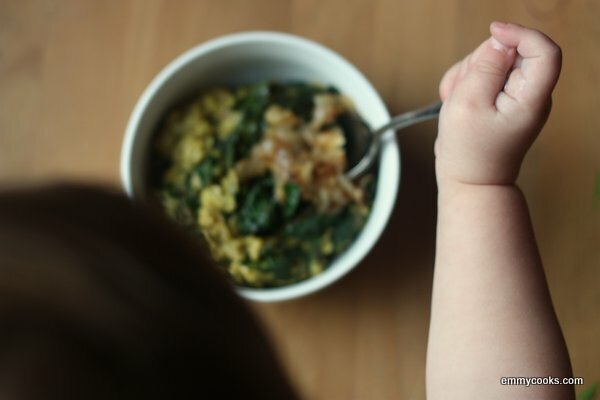 And finally, I am obsessed with savory oatmeal, and not just the one above. Today’s had blue cheese, black pepper, and an olive-oil poached egg. There’s also a version in the works with peanut butter, soy sauce, and spicy sesame oil. Do you have any recommendations for me in this vein? Once again, thanks for cooking along! Thanks for visiting Emmy Cooks! You can see some of my favorite recent recipes by clicking the “My Favorite Recipes” category on the sidebar (here are July, August, and September). If you like what you see here, you can sign up on the sidebar to receive a daily recipe by email, add the RSS feed to your own reader, or follow Emmy Cooks on Facebook, Twitter, or Pinterest. 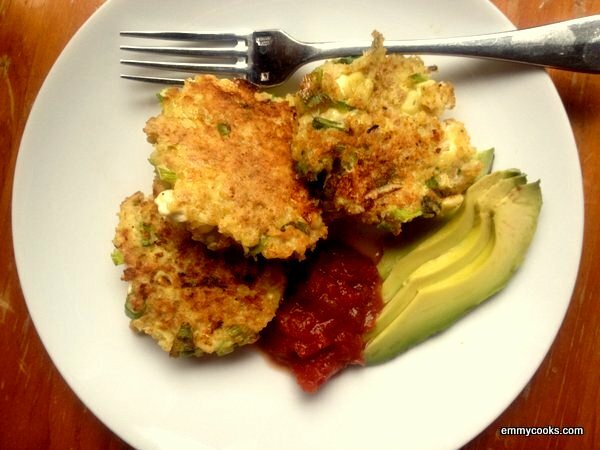 This entry was posted in Uncategorized on October 24, 2012 by emmycooks. 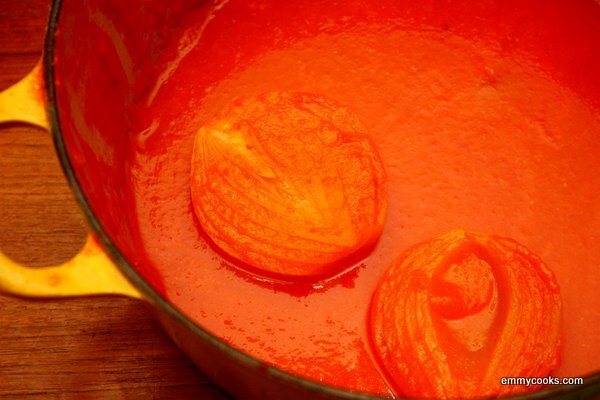 Have you made this tomato sauce? People swear by it. People LOVE it. People think it’s genius. I am completely undecided. The sauce has only four ingredients. One of them is butter. The sauce was so fine-textured that it clung delicately and evenly to each individual noodle. Its flavor was the summer flavor of the good tomatoes I used, enriched with butter and salt. 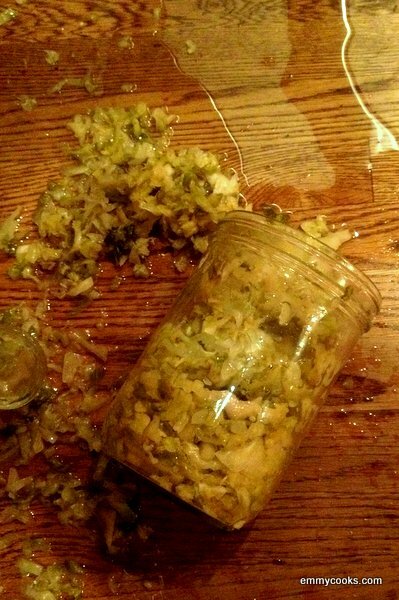 This entry was posted in DIY, Easily Multiplies to Feed a Crowd, Food, Noodles, Sauces, Uncategorized and tagged onions, tomatoes on October 15, 2012 by emmycooks.